As a founding partner, he has been with Roedel Parsons since 1990 where he has specialized in representing clients before state legislative, executive and administrative bodies. Johnny’s clients include Wal-Mart, Deloitte, Oracle, Hospital Corporation of America, AFLAC, Louisiana Dental Association and Louisiana Press Association. 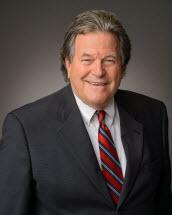 Prior to Roedel Parsons, Johnny worked as General Counsel for the Louisiana Association of Business and Industry. While at LABI, he was responsible for overall coordination and provision of legal services for LABI program and lobbying activity. He was the chief lobbyist for the Worker's Compensation Reform Act of 1983, and co-author of definitive work on the 1983 Reform Act, LABI Worker's Compensation Desk Book. In addition, he served as Staff Attorney at the Louisiana Department of Justice. Johnny received his BS and JD from Louisiana State University. He and his wife Sally have three children, Jady, Lindsey and Cary.